An exciting, faith-based program, like no other in our area. 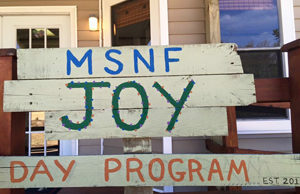 Our Joy Day Program meets Monday – Thursday at our location on the campus of Mt. Horeb United Methodist Church in Lexington, SC. This program, designed for adults with special needs, is an exciting, faith-based program, like no other in our area. Our participants spend time in an on-going learning center. Our program focuses on the needs of the individual, encompasses daily living skills, continuing education through our computer lab and classroom opportunities as well as a healthy lifestyle focus through exercise. Your kind contributions will allow us to expand our program and space as we strive to meet an ever-growing need in our community in our efforts to make the dreams and aspirations of special needs individuals come true. You can make a difference with a tax-deductible donation today. Your contribution will create more smiles and life changing experiences for the special needs families we support.